A "posted worker" is an employee who is sent by his employer to carry out a service in another EU Member State on a temporary basis. France extends the concept to drivers (employees) that travel there only to download/upload freight or persons from another Country (international transport services) as well as drivers that perform cabotage. Italy extends the concept only to drivers that perform cabotage, including the one performed after an international transport service. Minimum hourly rates of pay. Maximum work periods and minimum rest periods. Your company for complying with the requirements will only have to upload documents over the Internet, using a browser, to the server of SERVICIOS BAGEM, hosted in Amazon's Cloud, and appoint the representative of SERVICIOS BAGEM resident in the host Country. To have a resident representative in France and Italy and other Countries that follow suit. To have a confidential virtual place where to register posted workers (drivers) and upload documents linked to them as required in every Country. The concept of "posted worker" is different according to the country of destination. In France a driver is considered to be posted in Law sense when he is an employee (not a self-employed) and performs international transport with loading or unloading freight or persons in French territory (not the mere transit), or performs cabotage there. In Italy, however, the concept of posted driver is more restricted, since it only applies when the driver is an employee and performs cabotage in Italy, including as such the one made within 7 days following an international transport that is authorized pursuant (EC) 1072/2009 Regulation. In other EU Countries the concept isn't yet regulated. Labor laws are complex, but the ones that apply to your business are the Laws of the Country where your employees have habitually their workplace, which aren't the ones where you post drivers (except for long stays there). Therefore, your company doesn't need lawyers nor labor consultants in the posting Countries, but only a representative there for being a link with Authorities in order to make the required documents available to them. The representatives in the different Countries are provided by SERVICIOS BAGEM. You also need for France that certain documentation is kept on board the vehicles and for Italy to fill in a form and send it to the Ministry of Labor and Social Services before the stay in Italien territory starts. In both cases, you must make specific documents available to the Country's representatives to be forwarded in case to Authorities if required. This documents, which are partly different accordind to the Country, must be maintained after the completion of the posting period for a minimum of 18 months in the case of France and 2 years in the case of Italy. The easiest way to comply with requirements is to take advantage of the Country's representatives that SERVICIOS BAGEM provides you and to upload the required documents to the server of SERVICIOS BAGEM in the cloud of Amazon. French and Italien administrations, pursuant to the EU Directive, only try to control that their minimum labor conditions are applied to posted drivers from other Countries during their stay in their respective territories. If such minimums are met, your company will not have to do anything else than to make available to Country's representatives the required documents throught the server of SERVICIOS BAGEM. The minimum hourly wage to be met refers to ordinary hour wage that driver earns during his stay in France (despite its payment may be partly deferred to other periods). If there is a productivity bonus during the stay abroad, such bonus has to be recognized in the contract with the worker and must be clearly broken down in the pay slip with clear reference to each stay abroad, because otherwise this bonus will be diluted among the rest of ordinary hours encompassed in the pay slip. Gross wage calculation of the ordinary hour in a pay slip period must include all remuneration concepts, comprising the proportional part of any remuneration accrued daily, although paid later, any productivity bonus, but excluding expense reimbursements, extra payment for overtime, transport pluses and the like and any other expense compensation, even if it's set at a flat rate. For example, if the employee works 40 hours/week according to a contract or a Collective Agreement, the number of monthly hours to be computed in the pay slip would be 173.333 hours/month (40 hours X 52 weeks/12 months). Productivity bonuses accrued during the stays abroad, which aren't expense compensations, divided by the hours of the respective stays abroad, must be added but with the foregoing considerations. 9.69 euros/hour (driver of a vehicle of up to 3.5 tons), the gross monthly minimum wage, calculated out of the pay slip with the criteria of the preceding paragraph, would be 1,679.60 euros (9.69 X 173.333). 10.6445 euros/hour (driver of luxury vehicle...), the gross monthly minimum wage, calculated out of the pay slip with the criteria of the preceding paragraph, would be 1,852.92 euros (10.6445 X 173.333). The Labour Code in France sets forth that overtime should lead to a wage increase of 25% for the first 8 hours (ie, in France, for companies of 35 hours per week, it applies from the 36th hour to the 43rd hour). For subsequent overtime, the increase will be 50%. However, a different rate of increase may be established by a sector agreement or a collective agreement or a company agreement or an arrangement with the employee. The rate of increase in no case can be less than 10% with regard to ordinary hour remuneration. Maximum working hours and minimum rest periods are respected in accordance to French Law or collective or sector agreements. It is only required that the maximum working time, as well as the minimum rest periods are respected according to French regulation, regarding the time length of the stay in France of the driver (see links). For example, the maximum weekly working hours must be respected if the driver stay in France is more than a week, but not if the stay has shorter duration. In Italy there is no legal minimum wage as in other EU countries, but the minimum wage can be established in the sectoral collective agreements. The enforceable minimum labor conditions have not yet been published on the website of the "Ministero de Lavoro e delle Politiche sociali" as required by Article 5 of Directive 2014/67/EU. We will informed of these conditions as soon as they become available. Which are the documents required in France? Certificate of posting (ATTESTATION DE DETACHEMENT) for each posted driver, which should be filled in by the company and held on board the vehicle. Up to 31 December 2016 it must be printed using the downloadable form at Attestation de detachement d'un travailleur roulant ou naviguant dans le cadre de l execution d une prestation de services par une entreprise de transport. From 01 January 2017 on, pursuant "Decree 2016-1044 of 29 July 2016", the "ATTESTATION DE DETACHEMENT" must be submitted online at SIPSI (URL here below). Previously the carrier shall have registered an account with his details at SIPSI website with a "username" and "password" and then afterwards he can fill in and submit the online "ATTESTATION DE DETACHEMENT" Form(cerfa nº 15553*02)for each posted worker. "Attestation de detachement" online d'un travailleur roulant ou naviguant dans le cadre de l' execution d' une prestation de services par une entreprise de transport. SIPSI application allows to have repositories for predefined templates, duplicate previous declarations, locate declarations through filters, etc. You should become familiar with all that stuff. Notwithstanding the foregoing, already issued "ATTESTATIONS OF DETACHEMENT" in 2016 will continue to be valid up to their expiration or renewal dates. The submitted "ATTESTATION OF DETACHEMENT" shall be downloaded from SIPSI's website in order to a copy of which be held on board the vehicle. "ATTESTATIONS DE DETACHEMENT" are valid for a period of 6 months from their issuing dates, so that they cover all travels of a same employee during such period of effectiveness. Online "Attestations" aren't required to be available to French representative as the Administration will already have it, so you may not upload them on to SERVICIOS BAGEM website (the other documents shall be at the disposal of the representative). However, we recommend that you upload "Attestations" or at least upload its acknowledgment of receipt of having submitted it, so that it will then be easier for you to retrieve it from SIPSI website using filters. Notwithstanding the foregoing, "Attestation" validity period(date of start and end) should be recorded on the server application of SERVICIOS BAGEM for the use of "control diagrams" that is a very usefull feature of the application. Your customers will ask you to send or show them: (1) a copy of the designation of the representative in France and (2) a copy of the "Attestation" of the posted driver. For that you must have them ready. Copy of the employment contract of the posted driver. Unlike Italy, this hasn't to be translated into French, unless requested. Documents to be uploaded to the server of SERVICIOS BAGEM for the representative in France. In France the following documentation per posted driver, covering posting periods must be made available to the French representative and held for a minimum of 18 months after the end date of each posting period. It's important to record the posting periods of each posted driver on the server in order to take advantage of "control diagrams" at the application. If a driver is being continuously posted to another EU Country, you can record on the application a posting period without end date (void box) which will be represented on "control diagrams" as a continuous line. A copy of the payslip (in PDF format) of the driver covering the posting periods. Wage increase for each type of overtime hours in Euro during the posting period covered by the payslip. Period that payslip is referred to (it will usually be a month). Working and resting time referred during the posting periods that are covered by the payslip, indicating the number of normal hours and overtime hours with their increased wage. Permits, leaves and holidays and compensation items, if any, during the podting periods covered by the payslip. Document evidencing payslip payment, for example, bank account debit of wage payments. Copy of the appointment of the representative in France and his/her acceptance(this is provided by SERVICIOS BAGEM). This document can be downloaded from the server of SERVICIOS BAGEM, with the representation accepted through electronic signature of the representative. Certificate, if any, specifying name and details of the Collective Agreement applicable to posted workers. In Italy, unlike France, there is no obligation for companies engaged only in international transport, but only companies doing cabotage in Italy (domestic transportation) either regular or occasional, even the one linked to an international transport to or from Italy, made during the 7 days after it completion under Regulation (EC) No. 1072, of 21/10/2009. Italy, unlike France, does not require documentation on board the vehicle, there is no an "Attestation of posting" with validity of 6 months like in France, but companies that are going to post workers (cabotage) to Italy are compulsed to do a prior online communication of it within the previous twenty-four hours with a Form "modello UNI Distacco UE" (not yet available online) to the (Ministerio del Lavoro e delle politiche Sociale) Ministry of Labour and Social Policy, as well as any later change within the following five days. Identification data of the company. Number and general information of posted workers. Starting date, ending time and duration of posting. Place of the cabotage service. Type of services to be provided. Identification and address of the person resident in Italy who will be the link with Authorities (he is provided by SERVICES BAGEM). Identification and address of the person (resident or not) who will be, if necessary, the representative of posted workers during their stay in Italy, for second-level collective bargaining in Italy. Registration number of administrative authorization of the activity in your Country. In Italy, unlike France, only cabotage services within the Italian territory mean posting of workers (not merely transit or international transport to/from Italy). Benefits in cash or in kind linked to the performance of work abroad and any repatriation condition. Payslip of the posted worker covering the posting period. Document proving effective payment of payslip, for example, debit on the bank account of payroll payment. Communication to incumbent Administration of the start of the employment (eg. contract registration at Social Security). Certificate concerning the applicable social security legislation (e.g. Acknowledgement of the registration receipt in Social Security system). Designation of representative in Italy who will serve as liaison in communications with Authorities (this representative is provided by SERVICIOS BAGEM). Designation of a person, resident or not in Italy, to represent if it is needed the posted drivers during the posting periods for second level collective bargaining in Italy (he/she shall be somebody of the Company's staff). On one hand, it has to be remembered that minimum labor conditions shall be only met during worker posting periods in the other Country and not when they are out of them. "Allowances specific to the posting shall be considered to be part of the minimum wage, unless they are paid in reimbursement of expenditure actually incurred on account of the posting, such as expenditure on travel, board and lodging." Thus, the Directive explains what to do that is to establish allowances during the posting period, (e.g. a productivity allowance or similar) not related to reimbursement of expenses. These allowances shall be established in the contract with the employee and they should be itemized on the pay slip, as otherwise their amounts would be diluted among all the hours of the pay slip period. "Carrier" (hereinafter "carrier/s") for managing their own data and documents to comply with the legal requirenments in other host Countries where he posts drivers; they can designate in any Country the representative of SERVICIOS BAGEM or any other one. "Carriers" have only access to their own data and documents. "Agent" (hereinafter "agent") for registering and managing data and documents of their carrier clients. They can assign "usernames" and "passwords" to their carrier clients for sharing the work with them. They and their clients can use a sub-domain on the server with customized logo and image designed by themselves. "Agents" have access to their client's data and documents. The agent figure can also be applied to "associations", "purchasing centers", "cooperatives" and similars. SERVICIOS BAGEM will invoice his fees to the "agent" and will not have any contact with the clients of the latter. "Companies of non-cash means of payment (cards and OBU's) for payment of motorway tolls for carriers,,...". These entities can integrate this service into their website through which clients by a link will land in a web page of a sub-domain on the server with the logo, image and design provided by the relevant entity. When clients login through the entity's website, they will be identified on the server by internal codes provided by the entity of non-cash means of payment, what would allow it to collect our service fees to clients. This avoids clients the need to have an account funded with us for the payment of our fees. Under the standard procedure, unlike "agents", these entities will neither register their clients nor have access to their data and documents. User registration, uploading documents and the entering of data will be performed directly by the clients or their agents. Clients first time they login shall register through the sub-domain on the server. In this case, the "client" should hire the service from the private area of the website of the "Company of non-cash means of payment". By doing so, client expressly agrees that the service fees shall be charged through the "Company of non-cash means of payment". The invoice of the service to the "client" will be issued in any case by SERVICIOS BAGEM, SL, available to the "client" at the website of the SERVICIOS BAGEM, SL. In any case "client" will have contracted directly with SERVICIOS BAGEM, so the registration (login) will not be linked to the "company of non-cash means of payment". Later, if "client" wishes, it can login directly to "www.serviciosbagem".com", but then it must hold the account at SERVICIOS BAGEM as described here below in How to hire the service?. Also you can login through the website of a different "company of non-cash means of payment" accepted by SERVICIOS BAGEM. If you change of "company of non-cash means of payment" your bill will automatically be charged through the last one been used. An "agent" can register "carriers" without limit and can at any time assign to each of them a "username" and "password" that will be temporary as the "carrier" shall change them for security reasons. 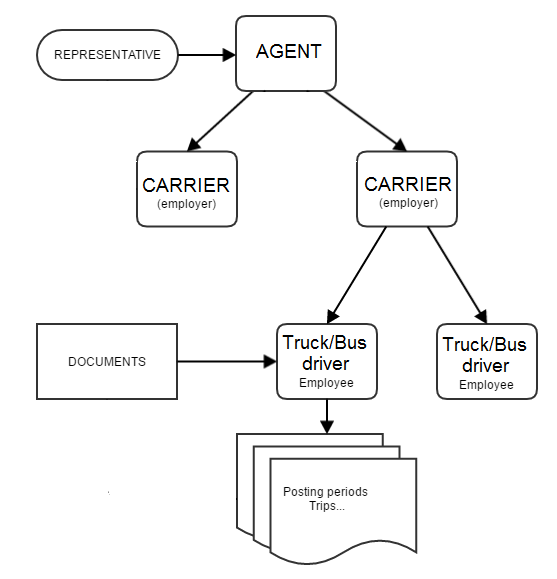 The "agent" can also register posted drivers, their posting periods, as well as uploading, updating, and deleting documentation linked to every driver, on behalf of the "carriers" he has registered. All data and files on the server are encrypted, so that they can only be viewed and managed by authorized users once their ID has been successfully verified. Communications between server and user browser are encrypted under SSL protocols (Security Socket Layer). Users are identified by their "Usernames" and "Passwords". "Username" identifies the user, "password" verifies that there is no impersonation. "Username" is unique, it can't be repeated, because it determines the boundaries of what each user can view and manage on the server. The user can change his "username" and "Password" at any moment using the old ones which will be then cancelled. If the user don't remember his "password", he can request a new one at the server, which will sent an email to his currently registered email address with a link to be followed for entering the new secret "password". This procedure may be the security's weakest point of the system, especially if email address is wrong, but we have decided that the advantages overcome disadvantages. The user who registers himself as "carrier" chooses his own "username" and "password". This are the credential of account administrator, who can create other credential ("usernames" and "passwords") for employees. These other users can also manage the whole data and files of the "carrier". Though many users can use the same "username" and "password" simultaneously, it's recommendable that each employee has and uses his own credential, so server's log can record his activity as user. The user who registers himself as "agent", besides the foregoing, can register "carriers" and assign "usernames" and passwords" to them. The "carrier" afterwards can change the "username" and must change the "password" for security reasons. Both, the "carrier" and "agent" can view and manage the whole data and files of the "carrier" on the server. "Passwords" aren't sent to server anytime, but only a result of applying a "hash" function with a SALT on them which is performed at user browser (the reverse "hash" operation is unfeasable). So nobody can guess which is the true "password". Therefore, security lies in maintaining "password" secret. 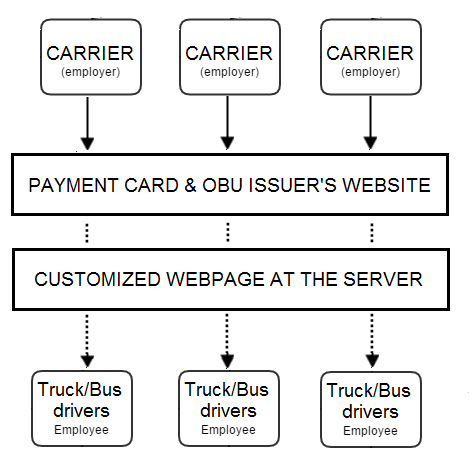 Posted drivers are linked to the relevant "carriers". On its turn, each document is uploaded and linked to the corresponding posted driver for providing coverage to his posting periods. The document with the representative designation in the relevant Country and his acceptance with his digital signature in PDF format, as required in the host Country, will be placed on the server by SERVICIOS BAGEM from where "client" can download it. The "client" must upload the appropriate documents in PDF format to the server, must link them to the corresponding posted driver, must place them in the appropriate place according to the document type and Country, and must record too with regard to each document its validity period (start and end dates). The "client" shall also register every driver posting period, with the start and end dates of it. The server checks for each driver posting period if there are valid documents currently linked to such driver that, taking into account the validity dates, cover the driver posting period. The control of coverage of posting periods by uploaded documents is easily done through "control diagrams" which is a feature provided by the application. The documentation on the server is only available to the "agent" and "carrier" that have uploaded it. Each one is identified by his "username". If someone registers himself again under other "username", out of the ordinary process of changing the "username" after login, he will be deemed as a different person and will not have documents available. Notwithstanding the foregoing, documentation can also be decrypted by authorized persons of SERVICIOS BAGEM and by the representative of the corresponding host Country, but only for the purpose set forth in this agreement. SERVICIOS BAGEM has declared, in accordance with current regulations of personal data protection, the existance of the files with personal data, indicating who is responsible of such files. At any time "clients" can access, rectify, and cancel their data. SERVICIOS BAGEM has a user licence of the server application. Copyright of the program is owned by its developer who is CIF, SL. There also are 2 pending patens on what the procedure has novelty submitted to EPO: EP16020292.5 y P201631035. The service is hired through electronic contracting. Contract come into force with the acceptance of contracting Terms & Conditions set forth by SERVICIOS BAGEM followed by use of the service. It can be done directly on SERVICIOS BAGEM server website or through the websites of a companies that provide "non-cash means of payment" with which SERVICIOS BAGEM has reached an agreement. At present there is an agreement with the Spanish means of payment outfit "Red Española de Servicios,SA (StarRESSA)". Service hired directly through SERVICIOS BAGEM website "www.serviciosbagem.com"
(EXCEPT DURING THE TEMPORARY FREE SPECIAL OFFER). A "client" account is created on the server upon acceptance of the service, wherein "client" must deposit an initial amount of at least €5. The deposit can be done through the Bank payment gateway at the website with ordinary credit/debit cards (visa, mastercard,...). Service fees will be charged on this account on a daily basis. At any time, "client" can refund his account in order to have enough balance for the cost of the service. The "client" will receive notice at his email when the balance of the account, extrapolating its current daily use, doesn't cover the period of the following 30 days. Periods with no active documents, the account will remain intact with no charges. Client's records therein will not be deleted up to one year of inactivity. On the website of the application, using any of the ordinary "payment cards" (Visa, Mastercard, etc.) listed in the bank payment gateway of the website or with PayPal. The payment will be always either of €5 or of a multiple of €5. SERVICIOS BAGEM has made an agreement with Red Española de Servicios, SA (and is negotiating with other companies) so that "clients" may hire the service through the websites of these companies providing "non-cash means of payment" for carriers (hereinafter, "Company of non-cash means of payment"). In this case, the "client" should hire the service from the private area of the website of the "Company of non-cash means of payment". By doing so ,client expressly agrees that the service fees shall be charged through the "Company of non-cash means of payment". The invoice of the service to the "client" will be issued in any case by SERVICIOS BAGEM, SL, available to the "client" at the website of the SERVICIOS BAGEM, SL. In any case your company will have contracted directly with SERVICIOS BAGEM, so the registration (login) will not be linked to the "company of non-cash means of payment". Later, if you wish, you can login directly to "www.serviciosbagem".com", but then you must hold the account at SERVICIOS BAGEM as described before. Also you can login through the website of a different "company of non-cash means of payment" accepted by SERVICIOS BAGEM. If you change of "company of non-cash means of payment" your bill will automatically be charged through the last one been used. It is understood that the "client" withdraws from the contract when there is no balance in his account or it doesn't use anymore the service. In this case, since SERVICIOS BAGEM as representative must keep the representation and the documents of drivers which were active until the expiration term set forth in the host Country, a negative balance can be generated that, if appropriate, will be settled if the "client" hires the service again. Client representation in host Countries is ended when client withdraws from the contract. When is it understood that the the service is been hired? He has start the use of the service or a representative in other Country. Other countries of the EU or the EEA in future may also require similar obligations to those of France or Italy to road carriers with posted drivers, under Directives 2014/67/EU and 1996/71/EC. By hiring the service your company will have and and the documentation required in several Countries in single place and under a single account.